Remaining time – this is Nikon only and displays the live view remaining time in seconds. The remaining time is controlled by the camera and it is there for preventing camera overheat. Zoom button – with the help of this button the user can change the live view zoom ration. Windows/Linux – by clicking on the zoom button with the mouse left button the user can increase the zoom ration and by clicking with the mouse right button the user can decrease the zoom ration. Long press (quick zoom) – after selecting a zoom ratio the user can long press the zoom button and the application will remember the currently selected zoom ration. After this pressing the zoom button will switch between ‘no zoom’ and the remembered zoom ration. To disable quick zoom long press the zoom button. Note: if you initiate the camera auto focus the application will discard the remembered focus positions. Focus movement buttons – with these buttons the user can move the camera objective focus ring. There are 3 steps (small, medium, large) in both direction (to closest point, to infinity). 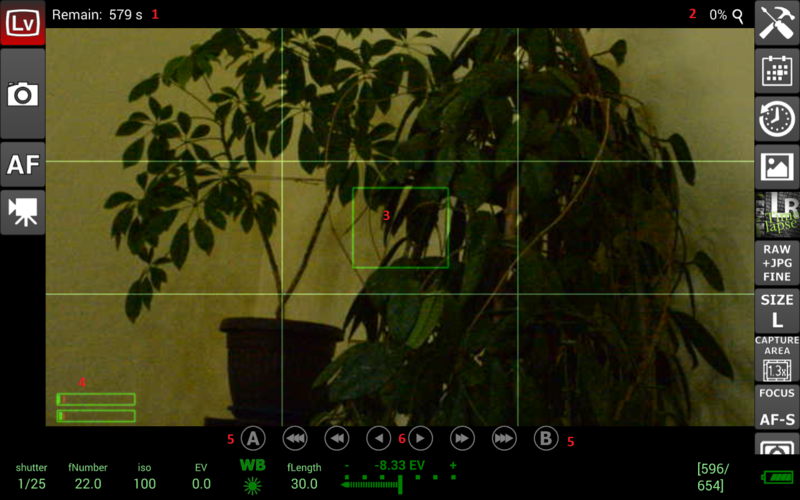 Note: to be able to move the camera objective focus the focus mode must be in AF-S mode.